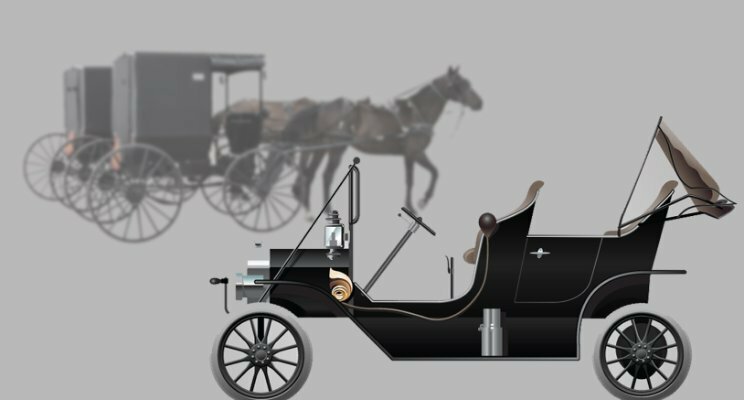 The Columbus Buggy Company, created by Clinton Firestone, and George and Oscar Peters, was one of the larger businesses in Columbus, Ohio in the late 1800s. By 1900, they employed over 1,000 workers and could produce one buggy every eight minutes. Henry Ford started the Ford Motor Company on June 16, 1903. In 1908, Ford introduced the Model T and built over 10,000 by the following year. In 1913, Ford built the world’s first moving assembly line and boosted annual output to 202,667 units. Columbus Buggy Company went out of business that same year, after attempting some changes, including shifting to automobile manufacturing; but it was too little, too late. Just how fast is the world changing? Do you feel a little like the Columbus Buggy Company in this rapidly changing marketplace? Just how fast is it changing? In the electronic world of transistors, Moore’s Law predicted in 1965 that the number of transistors that are able to fit on a computer chip will double every two years. Today, that rate is reaching its upper limit, and Moore’s Law will give way to a new era where the rate of change will multiply exponentially through advancement in machine and artificial intelligence. You may not be an electronics company, but almost every industry has been affected by improvements in technology. And the marketplace is increasingly more educated, with easier and quicker access to information than any other generation in the past. What are the critical components to effectively transform your company for this 21st century economy? First and foremost, priority should be placed on your employees and partners, who enable the development of products and the delivery of service. Empowered critical thinking on the front line is now the “secret sauce” for success for your business. As more is expected from your employees, much more should be expected for the stewardship of their professional development. Without your customers and revenue, you just have an expensive hobby. Clients have many more choices than ever before, and it is important to remain consistently relevant. More than ever, they prefer to buy into an experience than to be sold a product or service. And lastly, operational efficiency is key. Systems today can be hyper-efficient through myriad technological options, which need to be balanced with appropriate employee policies and procedures, because machine intelligence cannot replace human judgement…yet. Incidentally, Clinton Firestone’s nephew, Harvey, worked for Columbus Buggy Company before leaving and eventually starting the Firestone Tire and Rubber Company, one of the first global makers of automobile tires, which is still a market leader over 100 years later. Looks like he caught and held onto the wind of change.